Peterson Park--A Rock Hunter's Destination! 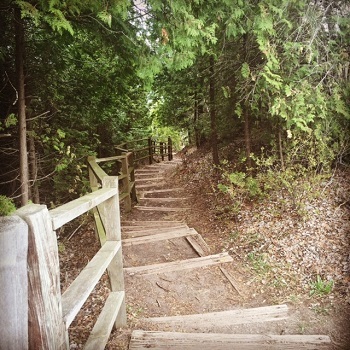 Located in the Leelanau Peninsula just outside of Northport, Peterson Park is situated high on a bluff overlooking a beautiful Lake Michigan vista, and features a unique stairway down to a rocky beach. Within Peterson Park, you will find plenty of parking along with picnic tables, grills, and restroom facilities. Walk down the stairs to the shore, and you'll find that the shore is covered with rocks of all shapes and sizes...a rock hunter's dream! Since this beach is well off the normal tourism routes, Peterson Park is more of a local's gem. If you enjoy a rocky beach, this park is well worth the detour and not too far from scenic M-22.